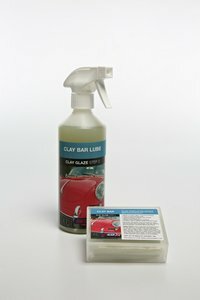 2 x 65g yellow non-abrasive poly clay bars in snap top box with 500ml trigger spray bottle of Lubricant for efficient and safe removal of debris bonded to car paintwork, glass and trim. Identical to Swiss-branded clay, at a lower price, this is a superb, safe, enthusiast product, proven to swiftly remove tar, tree sap, flies, brake dust, road debris and atmospheric fallout. Simply, it removes anything stuck to the surface which you woudl subsequently seal in with wax. Its the difference between a car that looks shiny and one that is glass-smooth, without little pimples of dirt. This product is safe to use by anyone capable of washing a car, will not scratch or marr when used correctly. It is non-abrasive, so will not remove scratches or swirls, but will remove anything stuck to the surface of the paint. Lubricant provided is more than sufficient to enable complete usage of the clay. Will remove bonded on contaminants and wax. Rewax after use. "The quality and efficacy of Zymol products is beyond belief.. and leaves friends gobsmacked when they see cars of over 15 years old gleaming, and interiors looking like new. I am hooked!!!! "